Kale also known as Borecole is a leafy form of cabbage, and like collard greens does not form a head. Along with mustard greens, turnip greens, collard greens and arugula they are and excellent addition to salads when the leaves are young and tender, and as cooking greens as they mature. The leaves of most varieties of kale are curly to some extent, but some varieties have flat leaves. 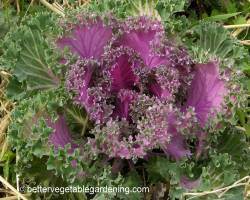 Some varieties of kale being referred to as, flowering kale or flowering cabbage, range in color from white, red, pink, lavender, blue or violet. Although these varieties are usually grown for their colorful leaves, the interior leaves are also edible. This cool season vegetable thrives in the cool climate of early spring and fall, is tolerant of hard frosts and like other brassicas their flavor is enhanced by these cooler growing conditions. Kale grows best in cool moist soil that is enriched with compost. Soil temperature for growing kale is between 60°-65° and does best when pH of the soil is between 5.5 and 6.5.
best planting method; direct sowing or seedling transplants. Kale will happily grow from either being direct sown to the garden or planted as seedling transplants. 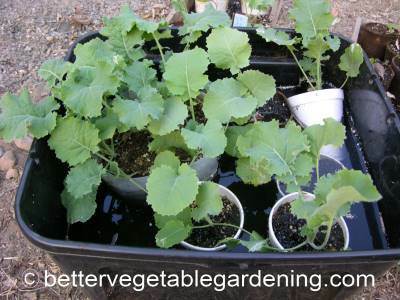 The secret to growing sweet kale from seedling transplants is to keep the seedlings growing forward without any growth checks. 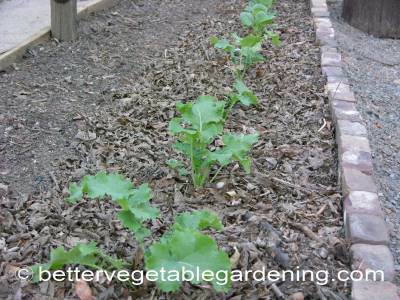 Young kale leaves are really tasty in salads so if you plan to harvest the kale leaves at their youngest stage thin kale 8 inches apart in rows 18-30 inches apart. 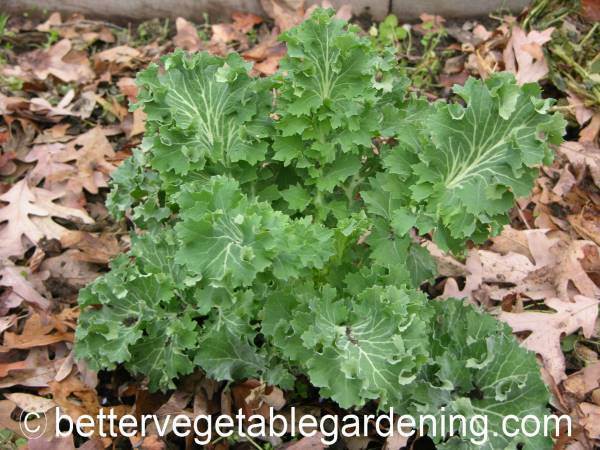 Older kale leaves are good for cooking but are not suitable for salads. 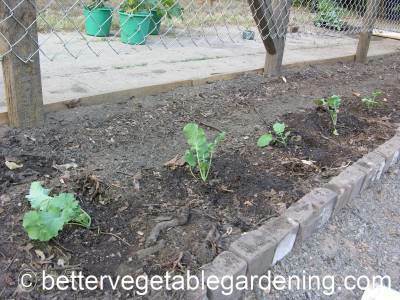 Alternate spacing is to give the kale plants more room to grow using a 16 inch spacing. Kale produces sweet, crisp leaves if soils are kept moist, it does not like to dry out. Using straw mulch around the plants helps retain soil moisture but kale does need to be watered regularly throughout the growing season. Mulch is important to keep the ground cool. Mulch will help keep the ground cool and moist as well as reduce weed competition. 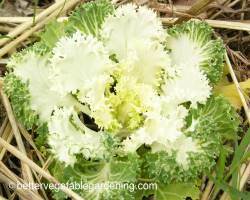 Growing good kale is the same as most members of the Brassicaceae family. Use a good organic all purpose fertilizer before sowing or transplanting and keep the kale plants growing at a steady pace with two weekly applications of fish fertilizer during the growing season. To help reduce disease, do not plant kale or other member of the Brassicaceae family in the same place in the garden more than once every two or three years, a four year rotation is better but often more difficult in the home garden. 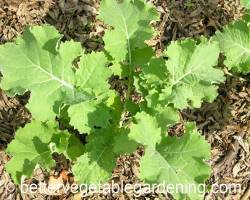 Kale can be harvested as soon as the leaves are big enough to be used. The very young leaves are excellent to use fresh in salads. At all stages of harvest the flavor is best after a frost. Harvest by clipping off the outer leaves if you want the plant to keep producing, or harvest the entire plant. Always wash and dry leaves thoroughly before storing. Store kale at 32°F with a relative humidity of 95% to 100% to maintain its fresh green color and flavor. Stored with adequate air circulation it will keep for between 14 to 21 days under ideal conditions. Do not store kale with vegetables and fruits that give off ethylene gas.